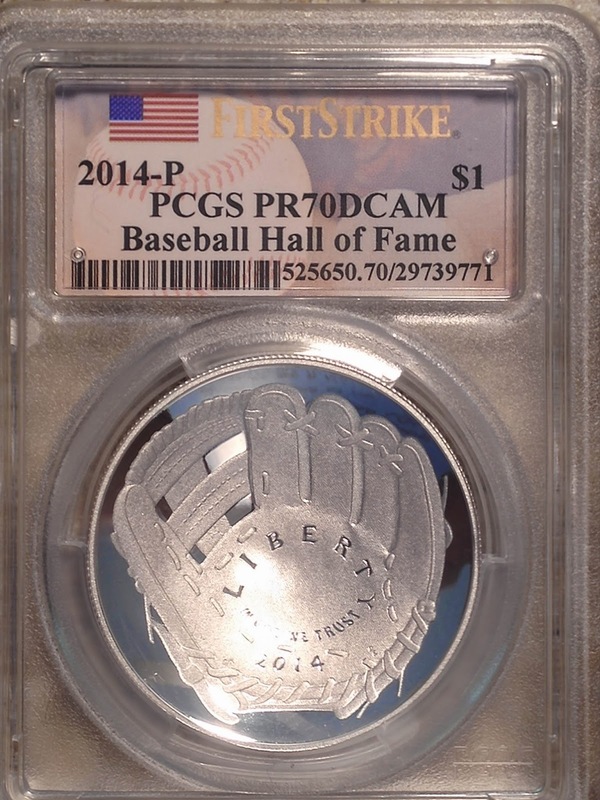 Tony Lawrence's Coins & Stuff: Baseball Hall of Fame coins - flash in the pan? As the delayed silver orders have now been shipping and as the gold are expected to ship next month, all the wise heads say that these prices will go down. They say that because that's what generally happens with things like this - an early flare up, a quick cool down. However, "past performance is not a predictor of future results" here or anywhere else and this situation is actually quite different from other commemoratives. First, this three dimensional curved design is the first of its kind in United States Coinage. As such, it's a desirable coin for type collectors as well as those who collect commemoratives. If the Mint continues to make unusually shaped coins, that could create a new type of collector. Let's call them the "neo-numia" collectors. As the first of its kind, the BHOF would be an absolute must for those collections. Already people are collecting "shark jumpers" from around the world - the BHOF is obviously part of those, expanding them to a world wide market. Then we have the sports fans and sports memorabilia collectors. Although other commemoratives have certainly appealed to their own interest groups, none has had the large numbers represented by those groups. Given all that, it's hard to say what will happen with prices. Certainly I'd expect a dip, but I'm not sure how much. Nor am I sure what the longer term outlook is. Once this technology is perfected it may at some later date join the British technology to produce “super coins” for circulation that hopefully will frustrate counterfeiters for a long time into the future. The technology should also make it interesting when a coin is flipped at the beginning of a sporting event. If that happens, the BHOF's will be very, very important as the first of their kind in the United States. Remember this: most of the wise heads did not anticipate the demand that these coins enjoyed. They generally predicted mild interest and some expected a total wash out. They were completely wrong and their current predictions may be just as off base. After looking at a few coin dealers on line it looks as if the prices are starting to come down a bit on the "signed" coins.